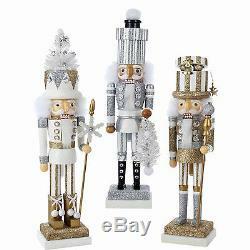 Christmas Holiday Nutcracker Home Indoor Wooden Decor 3 Pcs Set, Silver & Gold. This 3 pieces nutcracker wooden set is a classy and festive addition to your holiday indoor home decoration. It features 3 iconic and classic christmas characters with silver, white and gold finish. Their designs put a unique, vibrant, memorable twist on traditional nutcrackers. Each nutcracker is adorned with glitters, snowy sparkles, beads, stars, christmas presents and tree. 3 pieces nutcracker holiday indoor decor set. Classy and festive christmas accessory for your home. With silver, white and gold finish. Overall: 19.4'' H x 15.4'' W x 5.8'' D. Overall Product Weight: 2 lbs. Additional Materials: Feather, composite wood, paint/mica. California Residents: Proposition 65 warning WARNING: This product may contain chemicals known to the State of California to cause cancer, birth defects or other reproductive harm. To view more great products! The item "Christmas Holiday Nutcracker Home Indoor Wooden Decor 3 Pcs Set, Silver & Gold" is in sale since Tuesday, October 25, 2016. This item is in the category "Home & Garden\Holiday & Seasonal Décor\Christmas & Winter\Ornaments". The seller is "golden_glove_products" and is located in Multiple locations across the US. This item can be shipped to United States, Canada, United Kingdom, Denmark, Romania, Slovakia, Bulgaria, Czech republic, Finland, Hungary, Latvia, Lithuania, Malta, Estonia, Australia, Greece, Portugal, Cyprus, Slovenia, Japan, China, Sweden, South Korea, Indonesia, Taiwan, South africa, Thailand, Belgium, France, Hong Kong, Ireland, Netherlands, Poland, Spain, Italy, Germany, Austria, Russian federation, Israel, Mexico, New Zealand, Singapore, Switzerland, Norway, Saudi arabia, Ukraine, United arab emirates, Qatar, Kuwait, Bahrain, Croatia, Malaysia, Brazil, Chile, Colombia, Costa rica, Panama, Trinidad and tobago, Guatemala, Honduras, Jamaica, Barbados, Bangladesh, Bermuda, Brunei darussalam, Bolivia, Ecuador, Egypt, French guiana, Guernsey, Gibraltar, Guadeloupe, Iceland, Jersey, Jordan, Cambodia, Cayman islands, Liechtenstein, Sri lanka, Luxembourg, Monaco, Macao, Martinique, Maldives, Nicaragua, Oman, Peru, Pakistan, Paraguay, Reunion.